Sumptuous Olive and Cranberry eyeshadows by Mac, I must have talked about these before and if I haven't then I don't know why I haven't, how slack of me. These colours are perfect for adding a bit of colour to daytime looks. I've been using them in similar ways, with soft browns blended through the crease and then one of these slapped straight on the eyelid, blended in and voila. Mac Spice lipliner is a bit of a classic and I've been using this like there is no tomorrow! It's a lovely brown/pink shade and this works with so many lip products in my collection so I get tonnes of wear out of it. 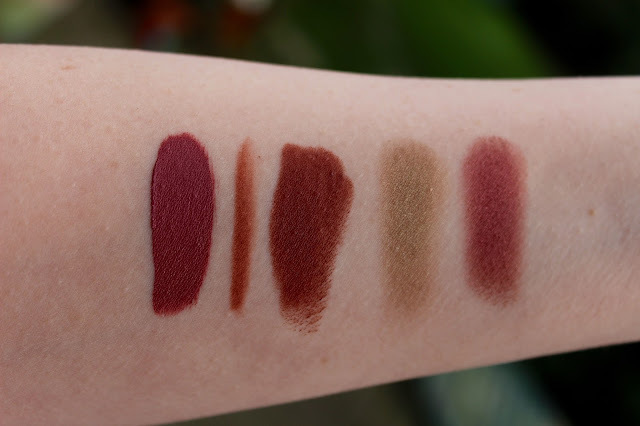 I've done a post on my Mac Lipliner collection so go and check that out if you're interested in knowing more about these pencils by clicking here. Another Mac product! This one is the lipstick in Persistence. This works a treat with Spice lipliner, they're like BFFs. I was a bit scared of this when I first got it because its on the brown side but it has enough of a peachy tone in it which makes it really wearable. I tend to rock this with a matt brown or caramel toned, smokey eye. The Sephora Cream Lip Stain in Marvellous Mauve is having a moment with it popping up on blogs all over the place and the hype is totally justified. Its a gorgeous mauve shade (as the name would suggest) but its not the colour that impresses me the most, its the formula. Of all the 'stain' type products I've tried this is easily the most comfortable on the lips, I don't find it drying at all and it needs minimal touching up making it ideal for a day to day shade. Paco Rabanne Olympea perfume is a fragrance I just can't get enough of at the moment. Let's try to describe the smell, something that is easier said than done.... It's a very distinctive scent which I really like as so many perfumes all smell the same to me so when I find something unique I tend to snap it up. I bought this on my summer holiday as its quite fresh and definitely a perfume that can be worn day or night. I always buy a perfume when I go away because it then reminds me of that place, so every time I spray this I imagine myself on the beach in Portugal! I wish!! 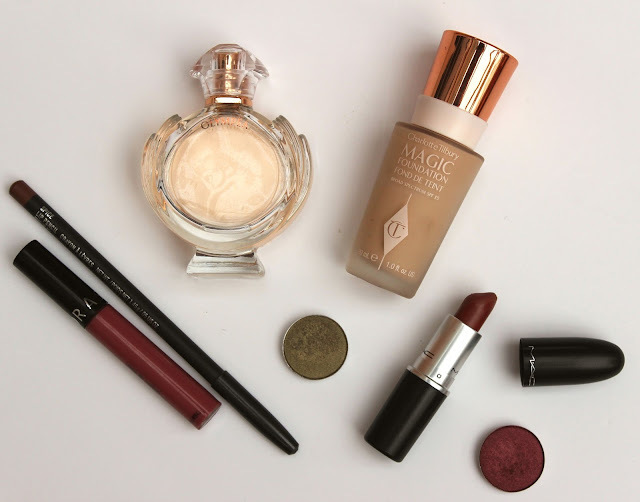 Charlotte Tilbury Magic foundation, I've been using this loads the past few weeks and it really is a beautiful foundation. It makes skin looks flawless and its just so easy to apply, some foundations I find you really have to work to get a smooth application but this just does all the work for you. I can also get away without touching this up throughout the day too which it a major plus point, powdering throughout the day is such a chore. And of course in true Charlotte Tilbury fashion the packaging is very pleasing on the eye, I swear this woman never gets it wrong. Have you been loving any of these products this month?